Amid Donald Trump’s threat to scrap a deal on immigration and his latest controversial remarks, the Federal Government could be shut down on Friday. The latest supplemental funding to keep the Government open, necessary because the Trump Administration has yet to present its first budget to Congress, expires on January 19. However, a renewal is in jeopardy because of Trump’s repeated declarations this week that a deal on Deferred Action for Childhood Arrivals — the program from 2012 ensuring that almost 800,000 young undocumented immigrants, “Dreamers”, can remain in the US — is “almost dead”. It was during a discussion of immigration last week, with Republican and Democratic legislators, that Trump spoke of immigrants from Haiti, El Salvador, and Africa coming from “shithole countries”. At that meeting and others, Trump and hardline Republicans have put conditions on DACA legislation, including full funding of The Wall on the Mexican border and an end to immigrants bringing relatives to the US. 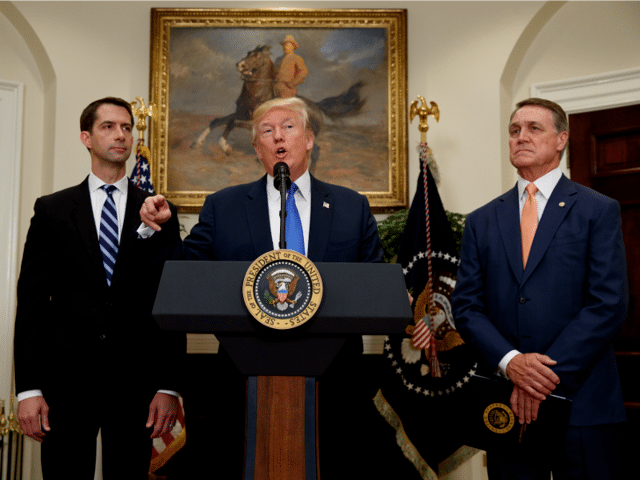 Hardline Republican Senators David Perdue and Tom Cotton have tried to absolve Trump, first saying they did not hear anything in last week’s meeting and then saying that he did not use the word “shithole” (although a White House official put this in context by saying that the actual word was “shithouse”). But Short said the proposal does not do enough for enhanced border security and failed to prevent immigrants from bringing relatives to the US, described by hostile Republicans as “chain migration”. The official also objected to new visas for hundreds of thousands of people stripped of Temporary Protected Status by the Trump Administration. The residents of El Salvador, Honduras, and Nicaragua had been allowed into the US for more than a decade after devastation of their countries by earthquakes. Short said negotiations will resume on Tuesday, hosted by Representative Kevin McCarthy of California, the House Majority Leader.